"After playing Jewel Match Naturescapes I have to say that visually it is a delight. There is depth of field, exquisite flowers and natural landscapes. The match-3 game mechanic is as expected, but a person can be trapped pretty easily and the chains keep the game interesting and fun. To my mind, the beauty of the game is the beauty of the game." You have come upon a land of such beauty, but the surrounding areas are barren. Match through nature across sprawling levels, collecting resources to replenish majestic landscapes and restore the beautiful kingdom. Play bonus Hidden Object and jigsaw puzzle mini-games and visit the shop to purchase a myriad of items to help you as you explore each area. You can even search the optional garden in every level for extra rewards. Enjoy a soothing orchestral soundtrack and scour each level for stars to unlock special decorations for each landscape. 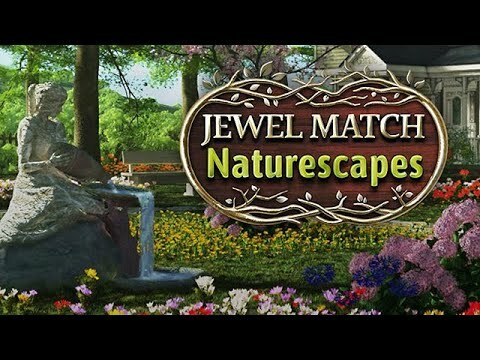 Jewel Match: Naturescapes is a fun and exciting game. It has amazing graphics and various bonus games. I loved the graphics and had fun playing. The scenery is absolutely gorgeous, and I love creating the backgrounds. This is a really good game. I like all the levels. Every level is different and challenging. I am glad I bought it.